If you’re obsessed with the Easter Bunny, I’ve gone through that city calendar to find exactly where he’ll be in the next weeks! If breakfast is the most important meal of the day, how much better is it when the Easter Bunny is there?! Saturday morning, at Eastland Mall, kids can enjoy peeps, pancakes and syrup, entertainment from Studio D, a chance to win an Easter basket and crafts. The Easter Bunny will visit each table to give special time to the kids! And Easter egg hunting is always fun, right? This Saturday at Redeemer Fellowship Church, kids up to 11 years old are welcome to hunt for eggs. They’ll have other games, face painting, prizes, and food for your family to enjoy this Easter season. Registration starts at 10:30am and the hunt will follow at 11. Did you know that the Easter Bunny can ice skate?! Saturday, Swonder Ice Arena team members will hide eggs throughout the building. Admission is $5.00 and includes the egg hunt, the special skate with the Easter Bunny, and skate rental.. The egg hunt is for children 11 and under and starts at noon. Skating and the movie “Peter Rabbit” will begin at 12:45pm. The Easter Bunny will hit the ice at 1. Next Saturday is the city-wide Easter egg hunt at Old National Events Plaza! Beginning at 9:00 am, they will have 12,000 eggs for the kiddos to hunt for as well as inflatables and food trucks! 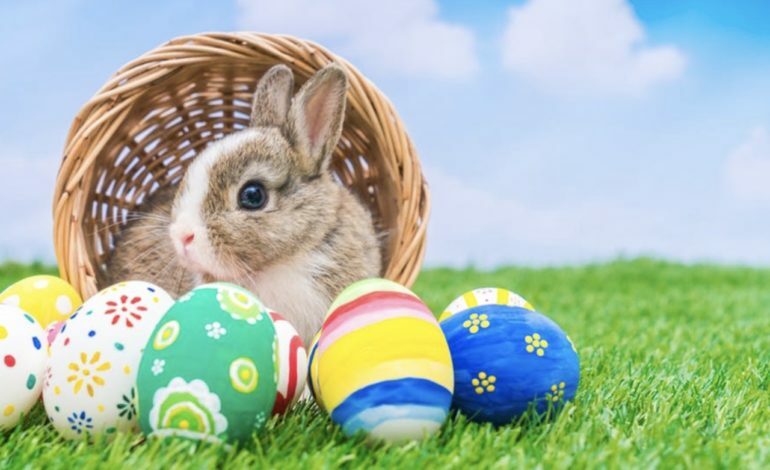 Kids 0 to 5 will begin hunting Easter eggs at 10:00 am, then big kids ages 6 to 12 will begin their own Easter egg hunt at 10:30 am. And also next Saturday, you can head out for an Easter egg hunt at St. Peter’s UMC! They’ll also have crafts, games, story reading, lunch, and you can learn the true meaning of Easter! Bring your own basket and have a wonderful time! You can even meet the Easter Bunny at Sweet Bettys Bakery next Saturday, from 2-4 pm. You’ll be welcome to take as many photos as you like with any kind of $5 purchase. They will have free candy filled eggs for the kids and all kinds of Easter treats available to sweeten your celebration. For more, you can check out the city calendar at thebestdayeverevansville.com. Here’s hoping you get to meet the Easter bunny, and you find all the eggs you could want.